If they can make sharks fly, cars can be made to do the same. Below was the coolest car I photographed at ESTA Safety Park Dragstrip near Cicero, New York on Sunday, August 23, 2015. The Sharknado Pontiac GTO racing at ESTA Safety Park Dragstrip near Cicero, New York. Nikon D750/70-200VR, 1/30s, f/13, ISO 100, EV 0, 200mm Focal Length, tripod, cropped. My goal was to push my panning skills some. Normally, I shoot the cars at ESTA at a shutter speed of 1/250 or 1/125. For shutter speeds less than that I used a tripod. I found at 1/60th of a second, I could easily get the cars but found the photos were not that much different than what I had done before. When I dropped the shutter speeds to 1/30th of a second, I got the look I was going for. Much more background movement behind and in front of the dragracers. Pontiac Firebird racing at ESTA Safety Park Dragstrip on Sunday, August 23, 2015. Nikon D750/70-200VR, 1/30s, f/13, EV 0, 125mm Focal Length, tripod, cropped. In using the tripod, I knew the panning motion would be smooth and level. I only needed to pan at the correct speeds. Remember, in motion photography, success is getting one or two photos out of a series of shoots. For instance, I took 300 panning photos and have selected 84 which might be good enough to keep. Once I edit those, I will end up with about 20 I feel will have that WOW factor when people see them. 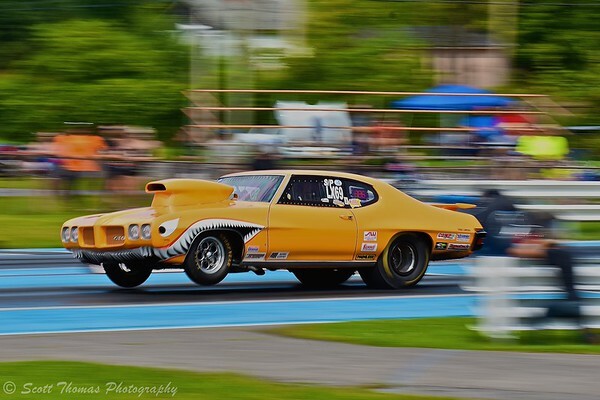 This entry was posted in Weekly View and tagged 70-200mm, automobiles, blur, cars, cicero, esta safety park dragstrip, firebird, gto, motion, movement, new york, nikon D750, panning, pontiac, race, racing, sharknado, summer, tripod, vr. Bookmark the permalink. Nice panning work, Scott. When I saw these I figured you must have used a tripod. That’s a lot of horizontal blur while still keeping the cars nice and sharp. Well done! Nice job, Scott. I wish I had the time to get artistic and produce shots like that! I know you have clients to produce for. I wish the same when I am shooting for my clients but you just do not want to miss something. Love your work!